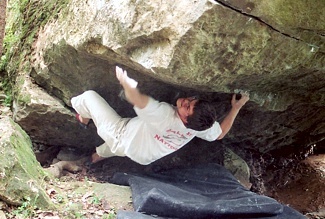 Muscatatuck Park is one of the only places in Indiana were you can rock climb. 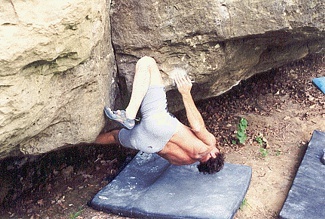 The climbing is primarily bouldering, although some taller climbs tend to be top-roped. The rock is dolomite limestone. The rock angle goes from dead vertical to completely horizontal roofs. Muscatatuck has about 300 problems. Most people will only do the more popular climbs. About 150 of the problems are clean independent lines with safe landings. A few of the other problems may have only been done a couple times and probably need cleaning, or they may be a variation problem. The majority of the climbs are V0 to V-. (5.10 and below). There is good representation of V1 to V5. Currently there are a few harder problems V9 to V11, and still a few projects left undone. We are working on the new guide currently and should be done this year. Bouldering Guide to be supplied in near future. Local developers have also developed a few private areas in the county. There are about ten other walls in the county that have been climbed on. Access is a bit uncertain to most of these areas, but we are working to gain access to additional problems. Climbing is a dangerous activity!